I have a confession. When I went on that photo walk in a cemetery not long ago, I used my program modes on my camera instead of shooting manually. I was a bit embarrassed because everyone else talked f-stop and aperture. I just chose portrait, landscape, or sports mode and shot away. Actually bumbling through a conversation because I didn't want to admit that I was clueless about those things. In fact, my automatic, portrait, and sports modes on my camera have been three of my best friends. They have rarely failed me although I know, deep in my heart, that my photographs could be better if I would learn how to use my manual settings. So guess what? I signed up for a class. And I'm already learning. Now my f-stop is my new best friend, and I tend to like it on the lowest setting. That's what I used to create this photo of my bobbin jar. There's still so much to learn, but at least I'm tackling it head on this time. And not hiding behind my easy buttons. I am Just now really really really diving into the technical part if shooting. It's scary when you leave your friends behind....good on you-and love the image. Well....you are an excellent student .... because that shot is wonderful! All the years that I have been taking photographs I have very very rarely used the manual settings. I know shameful isn't it!! Love your bobbin shot, very skilfully taken. Hope you enjoy the photography class Roban and look forward to seeing more photos shot manually. 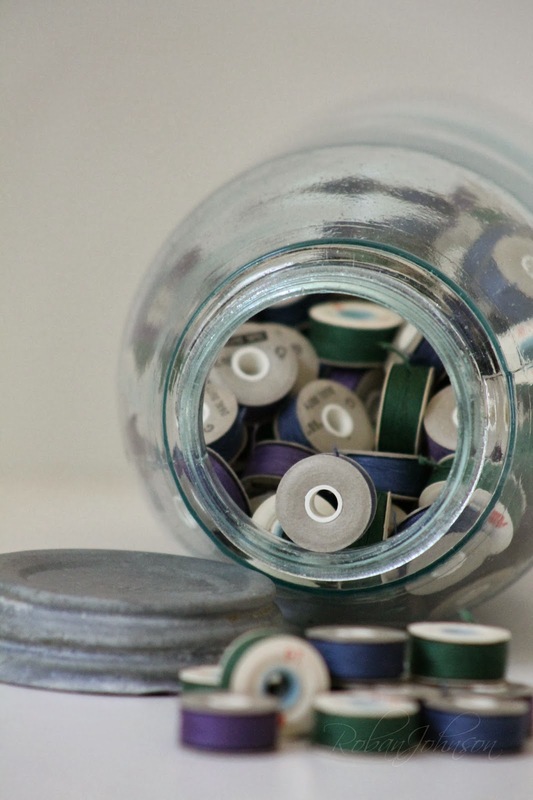 The bobbin jar is gorgeous. Good work, friend.